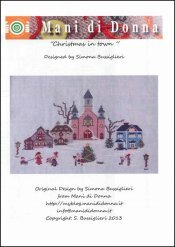 Christmas In Town [H6340] - $13.00 : Yarn Tree, Your wholesale source for cross stitch supplies. Cross Stitch pattern from Mani di Donna. It's Christmas time in town!! A house, stores & church are decorated for Chrismtas with wreaths, garland & Christmas trees. Kids are playing outside! A girl is pulling a sled & two kids are building a snowman. Stitch count is 165w x 109h.